Finding the best office chair that will suit all your needs serve you as you need is not always an easy task. There are always one or two things to sacrifice. You find a cheap one; you have to compromise on the features, if you find one with all the features then you have to dig deep into your pockets because it might be a bit expensive. That's not the case with the professional AmazonBasics High-Back Executive Chair. Apart from coming from a trusted brand, it comes at a very cheap price. It will not only provide you with professionalism but also ensures maximum comfort so you can work all day long. There is nothing as tiring as having to spend 6 to 8 hours sitting on a solid seat; it's also not good for your health. 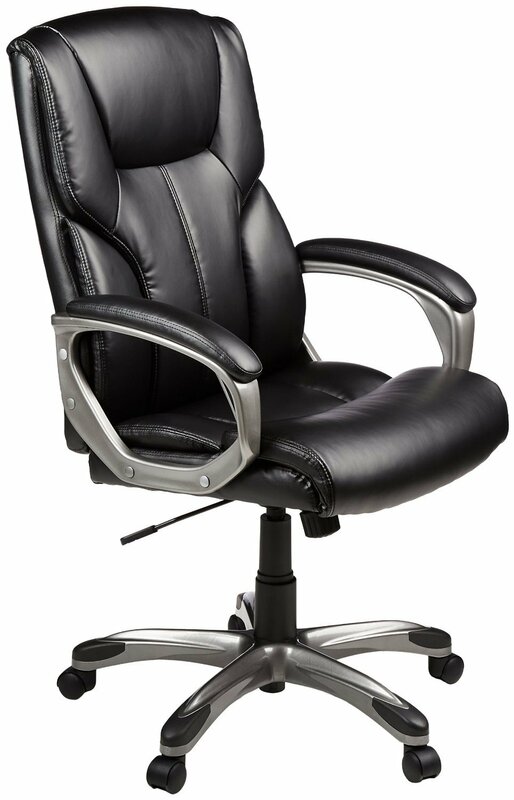 AmazonBasics High-Back Executive chair comes with the padded seat and back with cushions to ensure maximum comfort and support. Your arms can also rest comfortably on the padded armrest which, despite being small, offers maximum comfort. The soft cushion ensures you can seat on the chair for long working hours without getting tired. This will not only ensure you get the desired comfort, but you will also be more productive. If you want a seat that will serve you longer and provide value for your money, you have to go for one made with quality materials. Bonded Leather and PVC Upholstery used on the seat ensures the padded back and seat is all covered with smooth, durable material. These materials ensure the chair feels and looks like leather providing the durability and the look required for a budget-friendly office chair. The seat is, therefore, going to serve you longer and provide value for your money. The 360-Degree Swivel makes the chair easily movable for your convenience. The durable nylon caster enables it to roll smoothly from one point to another so you can multitask all you want without having to stand. Whether you want to move from one office to another, or you want to pick up something from the corner, you can do so without having to move from your chair. You also don't have to turn your neck when talking to your colleague as you can swing back and forth and have a fantastic time. The chair comes with fully adjustable settings so anybody can fit in regardless of your height. You can raise and lower the height of the seat to your preferred height. It can adjust for up to 41.34 to 45.08 inches. You can also control the tilt of the chair with the tilt-tension mode which you can adjust to make it easy or hard to tilt. 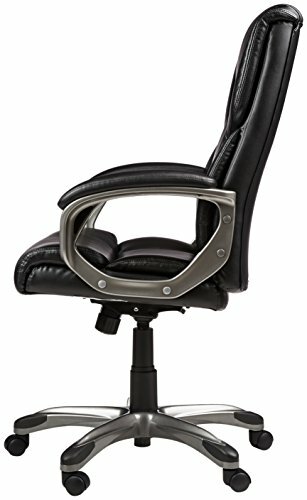 The adjustable seat, as well as the tilt and tension features, are essential for a good office chair. You will never get bored having to sit in one position for a long time, adjust and tilt your seat and having different sitting angles for maximum comfort. Provides maximum comfort thanks to the padded seat and back. You get quality at a cheap price. Made with quality materials to ensure durability. It has a low weight capacity. Comes with limited ergonomic features. How tall are the armrests of the chair? Answer: It measures 28" when the chair is fully raised and 8" above the seat. What are the highest height when fully raised and the lowest? Answer: When fully raised, the base of the seat is 20 inches from the floor. The lowest height is around 17 inches off the floor. How far can the chair tilt back? Answer: You can tilt the chair for about 30 to 35 degrees. Despite its low price, AmazonBasics High-Back Executive Chair doesn't compromise on its features in any way. From the review, it is evident that the chair is focused more on the positives than the negatives. This means you are assured of a quality product at a pocket-friendly price. The chair is no doubt the best choice for anyone starting a business or one who needs to replace the old office furniture. Furniscene.com is a participant in the Amazon Services LLC Associates Program, an affiliate advertising program designed to provide a means for sites to earn advertising fees by advertising & linking to Amazon properties including, but not limited to, amazon.com.